Pizza is America’s favorite food, and people want to eat it their way. Read about some of the most unusual and original toppings ever put on a pizza. Pizza is one of the most universally loved foods in the world, subject to many popular variations. In addition to the standards, some people have experimented with bold and exotic ingredients, resulting in flavors that are sweet, savory and even unsettling. Vegetables on a pizza are usually relegated to bell peppers, onions and sometimes broccoli; mushrooms and olives, the other standards, are fungus and fruit. However, there are other options. One bold choice is a beet pesto pizza, served with basil and goat cheese for a rich, unusual flavor. Another pairing that works well with the non-traditional goat cheese is thinly sliced butternut squash ornamented with sage and served over a white sauce. 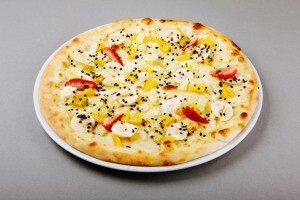 Fruit on a pizza usually doesn’t go past pineapple, but a little sweet can go a long way in bringing out deeper flavors. For a flatbread pizza, apply a balsamic glaze in place of a traditional sauce. Top it with bleu and Parmesan cheeses and add thinly sliced strawberries, tuna and capers. The contrast of textures and flavors will melt in your mouth. Alternately, replace the sauce with olive oil and go Greek with ground lamb, figs and feta cheese. Embrace Latin American cuisine with mangos, grated Habanero, chorizo and a generous amount of queso fresco over a chile-based pizza sauce. Let your imagination run amok and enjoy the results. Like Captain Kirk, pizza has been where no man has gone before, and sometimes to places it should never have been. One of the grosser combinations is a curried banana pizza popular in Sweden. More unusual still is a pizza Rod Serling could not have dreamed up: a pizza exclusive to Japan that replaces cheese with ikasumi – squid ink! With these culinary oddities, there are nearly unlimited pizza possibilities. Don’t be afraid to try something new at your favorite Fremont Street pizza in Las Vegas.